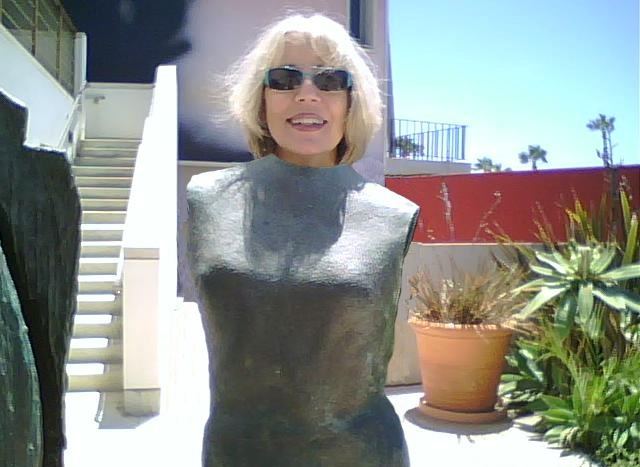 Diane Gage is a poet and artist in San Diego residence since the 1970s. Her poems have appeared in numerous publications and her artwork at galleries and museums in the US, Canada and Europe. Many of her projects are multimedia works that combine poetry and visual art, as well as interactive and performance elements. She has been active over the years in the San Diego art community through organizations such as Antenna Poetry & Graphics, California Fibers and Public Address. Diane also trained at the Expressive Arts Institute in San Diego in order to foster health and wellbeing through art-making. Most recently she has been combining her poetry and visual art into various forms of artist books. You can find out more at the “More about” link on this site. Seretta Martin: I’ve heard you read your poetry and I’ve seen your visual art, so I’d like to know — are you considered primarily an artist or a poet? Diane Gage: To me that’s like asking — do you have a mind or a heart . . . a body or a soul? The arts are not as separate as we generally like to pretend they are. Life and art are fluid and intertwingled and my favorite existential place to be is at some margin, or edge. I am profoundly marginal as a creative being. I find margins are where all the juice is, where change is showing itself, where new combinations and possibilities can emerge and evolve. DG: In practical terms, it means I write poems and I make visual artworks — physical aesthetic objects. I also intertwine the two, often weaving them into larger structures that include other muses and media. A recent example combines poetry and art in the forms of a collage-based Poem Tarot Deck and a set of 14 Oracle Books that include poems composed for each of the collages. but whose soul – looking which way? Which may not be the question at all. Unasked we’re in Eden, before the fall. blessing being – blessing between. windows blur with the slightest of hazes. mica in granite – phosphorescence in brine. SM: Did you write the poems in any sort of form? DG: There are different kinds of poems in the Poem Tarot deck. Some are narrative, some lyrical, some discursive, some light, some somber. SM: How did it all come into being? DG: Once upon a time in the current millennium, I made 70+ card-sized collages. On each one I put a word from one of six parts of speech and backed it with one of six colors corresponding to the parts of speech. These I laminated, the result a Poem Tarot usable as a Poetry Oracle. In this mode, a seeker 1) concentrates on an open-ended (not yes or no) question, 2) mixes the upside-down cards, 3) draws one of each color, 4) turns over the cards, and 5) ponders the revealed words & images in relation to the original question. The six combined words & images function as a somewhat mysterious mini-poem and mini-art piece as well as a kind of oracle for the questioner. Eventually I wrote 70+ poems, one per card. Some poems relate fairly closely to the word or image on the card, others not so much. Then I drew 14 sets of 6 cards each, combined them with their poems and made a set of 14 Oracle Books — an artist’s book of books. SM: Tell me more about using the Poem Tarot deck itself. DG: The Poem Tarot deck operates in an interactive performance dimension of art. 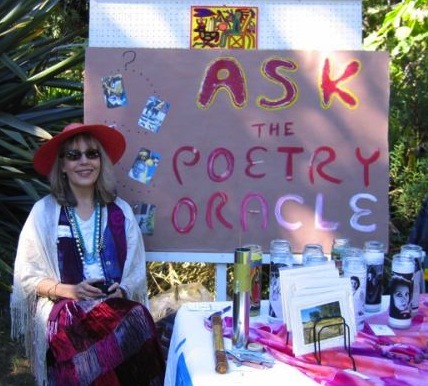 In collaboration with willing participants, I conduct Poem Tarot readings in which we consult the Poetry Oracle together. Since I’m trained in Expressive Arts Therapy & Counseling, sometimes these readings occur in a therapeutic context. Other times they’re for fun, at events such as the one in this picture, an Ilan Lael Foundation fund-raiser at what was then Quail Gardens in Encinitas. SM: I’m wondering how you come up with the idea for a project like this? How does that happen for you? DG: Most of my projects emerge and evolve from engagement with materials, processes and circumstances. The Poem Tarot began at a very busy time in my life when I could barely find an hour in a day for art. At first I committed to spending some daily time, sometimes barely a few minutes, with an art journal. Collage processes appealed to me most, so that’s what I did. After awhile I grew restless with the collages being trapped in a book, so to speak, so I began making them each on a separate piece of sturdy paper and the project grew from there. SM: How then did poetry come into play? DG: After I’d had the Tarot idea and made the deck, I felt I wanted to do something more with it. At the time I was under the spell of poet Kay Ryan, and wanting to write shorter, pithier poems. Longer, more narrative “I this, I that” poems weren’t calling to me, so it was a treat to let the images inspire poems. Not to mention indulge my lifelong, fundamental joy in shaping language. By then I was well into my daily haiku-on-a-walk practice as well, savoring the delights of simplicity and compression. SM: Are you referring to your Walking in Birdland poems? DG: Yes. I’ve walked in my neighborhood – Birdland – for years. Since it’s small with strong geographical boundaries (canyons, freeways), the same old sights became tedious to me as the years went by. For awhile I spent my walk time working on memorizing poems, but then I started composing a haiku based on what I noticed on my walk. This proved an excellent practice as it made me experience each day freshly, notice detail and nuance, and get out of my squirrel-cage thoughts for awhile. Since the neighborhood was built in the 1950s, I used the 5-7-5 syllabic haiku form popular in this country at that time. It amused me to think of Basho walking the length of Japan composing his haiku and me walking around and around a single SoCal neighborhood composing mine. Eventually I put a year’s worth of those haiku into a multi-booklet format and now I post them on Facebook. 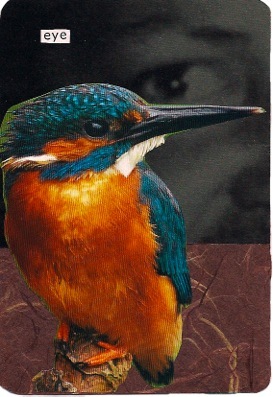 SM: I notice that both the Poem Tarot/Oracle Books project and Walking in Birdland consist of many small pieces gathered into a whole, somewhat like a mosaic. Is that deliberate? DG: When I was involved with fiber artists through California Fibers, I noticed how the art forms in that category, which is associated very strongly with women, often reflected the realities of women’s lives. So I wasn’t thinking of mosaic so much as quilting or weaving, where a larger structure is composed of many small parts. The accumulation of smaller pieces that can be worked on in small bits of time eventually add up to something more complex and substantial.